Very tasty food! Perfect service! Great atmosphere with delicious local food, everything you may want from Bologna! ottima cena e ottima location! Early sitting with reservation. Good traditional Bolognese fare. Crescentine, green lasagna, tagliatelle al ragu, grilled vegetables and house salad, house wine and water. Two diners, 50 Euros. Pretty decor: banked dark wood tables with (of course) red checked tablecloths. Very congenial service. Poor service , overrated , one waiter for the whole restaurant inside , unfriendly staff, enviroment isnot so good . Very nice ambiente. Fast and good service. Only the check takes a little longer, but that is fine to end the drinks in a relaxed way. The food is good and the menu very interesting. We went there earlier in the week and enjoyed the food so decided to return for our final night in Bologna. All good stuff. Excellent all the way down. It was value for money. The veal was excellent. The torta con riza delcious. Everything else we was good. Food tasty and portions generous. Nice mix of travelers and locals. Very basic fare. We were only diners originally so low on atmosphere. 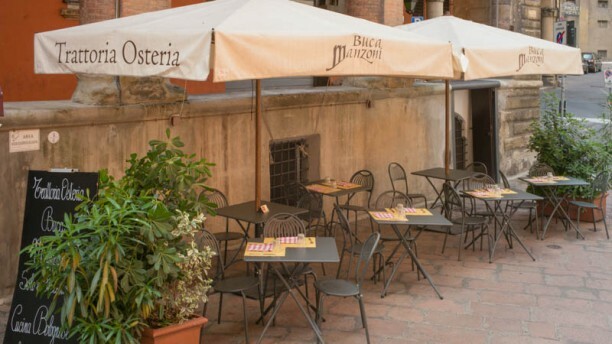 More exciting places to eat in Bologna without a doubt. Great restaurant. Recommended if you want a taste of what locals are eating. Good traditional Bologna dishes.